Everything should be lean and agile these days. But in an organization, as a whole leanness and agility are next to impossible to achieve or maintain over time. If the management model is in the way, no well-meant initiative to introduce “Design Thinking,” “Lean” or “Agile” Methods can ever be sustained over time. It really amazes me how many organizations pay for consultancies for “Design Thinking Workshops” or hire them to do the next system implementation by an “Agile Method” instead of the classical Waterfall Model – only to end up with mediocre results, budget overruns and 6-month testing phases from supposedly “Agile” projects. OMG – this is a lot to do. It will take years! It surely does. There are no quick fixes here. It is easier to hire some consultancy to run an agile project or build up a laboratory environment or run a Workshop on Design Thinking than to develop a master plan and start to work on all above dimensions in an orchestrated manner. A one-off action is undoubtedly easier – but ultimately fruitless. You really need to start with the people dimension. Without a fundamental change to central values and beliefs – especially those held in management – no strong convictions will lead to reshaping the organization, to build up the stamina to sustain, e.g., Agile practices and to invest millions in systems. What are the modern alternatives to the classical hierarchical management model? 99% of the advice found in management literature is just patchwork: Organize a company on trust, Embrace Failure, Exponential Organizations, Digitalization guidebooks, etc. Good ideas, mostly, but not holistic ideas. These three reasons are at the core of the puzzle why traditional companies find it so hard to mimic the success of start-up businesses and unicorns. But there are companies of any sector that made a successful transformation of their management models into the digital age, and there are templates of modern management models available. I have found three – if you happen to know more, let me know! But they are quite different in their values and prescriptions. With Poster child’s such as Gore (Textiles), Favi (Automotive) or Michelin (Tires, lately) this management model is not a new fashion, but one that has been around since 1960. One can argue that even as early as the 1960’s companies, like the car rental giant Avis under the Management of Robert Townsend, have been engaged in liberated leadership. Within this management model, all managers are supposed to leave the center stage of a business and let employees do and decide. Management role shifts solely to build an environment that fosters the growth of the individual and organizational learning while keeping the overall mission of the company updated and communicated. Companies are seen as an Organism, with a metabolism that is connects everything to everything, resulting in a complexity that can only be controlled by decentralizing control. Authors Isaac Getz in ” Freedom Inc” and Frederic Laloux in “Reinventing Organizations” (see sources) are both chroniclers as well as engineers of this Management Ideology. There runs a large streak of humanitarian good intent in this approach, with words as “Self-fulfillment,” “Human growth” and “Ascendence to new types of consciousness,” especially in the Laloux’s work. This can make this ideology hard to swallow for hard-nosed business executives. Which is a pity, as this wording distracts from the excellent business results in growth and revenue that this Management Ideology is able to deliver. It is just that the language is sometimes so esoterical, that conventional managers are overwhelmed by all the humanitarian goodness. I think that is an inherent sales problem that this approach has. It’s a pity that humanitarian values don’t sell to a conventional business, capitalist audience, but so is life. Holacracy (a word created from the Greek “Holons,” i.e., roughly speaking autonomous units) is the brainchild of Brian J. Robertson, an American Software Engineer, who invented the idea in 2007 and put it in a book in 2015. The most prominent company running the organizational model of Holacracy is the US Shoe Retailer Zappos. Basically, people become a part of this Operating System. They need to learn the system for the organization to succeed. They need to comply with the system. Where liberated companies can be so widely different in their organizational structures and procedures, holacracies claims that there is one right way of operating which needs to be there. Companies can be specialized in this or that respect (e.g., HR procedures, Expense management, etc. ), like Apps being installed on an Operating System. Holacracy received a lot of press attention and is well organized – as one would except for an “organizational” operating system.” Just take a look at Holacracy.org to get an impression. For me Holacracy seems like the rule-bound Roman Catholic Church, while Liberated Companies or Management 3.0 seem more like flexible Buddist beliefs, to stay in that metaphor. I do not think that it is by chance that another former Software Engineer, Jurgen Appelo, invented another streak of nonhierarchical Management which he named “Management 3.0“. Coming from a similar, Agile Software Engineering background as Brian J. Robertson, Jurgen felt that there is one component missing in Agile: The governance structures of companies and especially the way of managing these structures. Being an eager student of complexity theory, Jurgen came up with the conviction that Management is a craft to let companies achieve optimal results in complex environments. For this, it is essential, that the wisdom of employees is entirely used in a system of distributed control. So Jurgen wrote a couple of books about his convictions and – not to be outdone by Holacracies Brian J. Robertson – decided to do a business out of that, licensing Management 3.0 as a trademark to trainers and selling workshops. The advice given on Management 3.0 is much more detailed as in liberated companies and much more flexible than in Holacracy. Best of all, the Management 3.0 Model offers detailed instructions on how to incrementally move towards flatter hierarchies and does not a revolutionary big bang of change, that both Liberated companies and Holacracy require. It is, therefore, a much more practical approach. Oh yes, I like this approach. It is so close to what I called “Management Digital” in previous posts. Is it worth changing to a less hierarchical model? But hard scientific evidence on the performance benefits on company level is really not there: there are simply too many factors influencing a companies performance than just its organizational model. The organizational model is an important influence on a companies performance – there is evidence for that in empirical organizational research. But as a predictor of success, it is just not enough. Market Position, Competition, technological or demographical trends or simply pure luck (e.g., that one special deal) are all factors at least as important. That is the way it has ever been. But now with the rise of hyper-competition, ever-changing environments and a knowledge-based world of possibilities hitherto unknown, creating a learning, “generative” company is more important than ever. After all, Learning is the only sustainable competitive advantage there is. In the next couple of posts, I will dive deeper into Management 3.0, Holacracy and Liberated Companies. It is an exciting ride into some real alternatives to get organizational learning going and make the workplace a better place for everyone. Thank you for this great article. Personally, I lean more towards management 3.0, but in our organisation we do experiment with a less rigid variant of Holacracy. We like that it gives structure to non-hierarchical teams (circles) and promotes entrepreneurship on the lowest level by letting the circle define clear and explicit purpose and responsibilities for each role in the circle. The circle as a whole gets its purpose from the encapsulating circle. In that sense there is a purpose-hierarchy which frames and directs the autonomy of a circle. Thanks for your comment Marc. I think that combining elements from multiple systems is in the spirit of LEAN: It enables learning, which is great. I know of organizations who just pick the Meeting script from Holacracy to improve their Meeting culture, which seems to work for them. Let us know how your experiment with Holacracy works out, what you experienced! many thanks for that post, really like it! A few comments regarding the mentioned ‘Management Systems’. – M3.0 isn’t a management system to me. To my understanding, it’s a tool box for handling complexity better, but nothing more. – There is a new management system called “cooperative management” (not sure, whether the translation into English is correct or not, in German its ‘Kollegiale Führung’ which is based on many experiments out of systems like Lean, Scrum, Holacrazy etc. There is a book, which describes it quite good, but at the moment, it hasn’t yet translated into English. Maybe there are a few more points which you like to add. Good Info, Thanks, Ralf! I immediately looked up Sociocracy in https://en.wikipedia.org/wiki/Sociocracy and the title you mentioned. I can see your point about M3.0 being less of a system than Holacracy. Same is true for Liberated Companies. Both M3.0 and Liberation are more descriptive than prescriptive, which correlates with their aversion to state rules. As a manager, this leaves you with ideas, but not a recipe. to me, M3.0, Lean, Kanban, Scrum are all tools which can be used to handle a more complex world. SAFe, LeSS, Sociocracy, Holacracy, Sociocracy 3.0, cooperative leadership / management are more like a management system / frameworks. So taking decisions might be the main focus of the frameworks while the above mentioned tools are dedicated to get all the work done. – Sociocracy 3.0 has been release a few years ago including quite some changes compared to the original system. Therefore, it might be good to keep them separated. – Holacracy was initially more or less a 1:1 copy of Sociocracy and has been updated through several iterations into a different direction. To me, it’s a quite mechanic approach which leaves the human being completely out of the system. 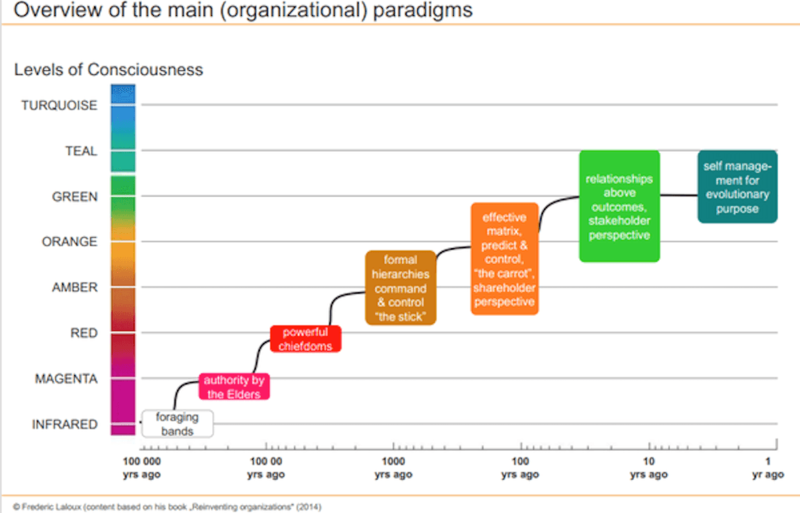 Have you had a look into Reinventing Organizations from Frederic Laloux? Ideas like “Teal” or “ResponsiveOrg” are based on that. Further, Niels Pflaeging has surely also mentioned more ideas in his books (not sure, if all of them have been translated into English). What a personally like are different paradigms described by Laloux which might be helpful to get a better understanding, how companies mainly act and about their intentions. It’s not accurate and precise but can be quite supportive. +1 on Ralf’s comments to add Sociocracy 3.0 (S3) to your comparison, and to distinguish it from the Sociocratic Circle Organisation Method (the ‘classic’ sociocracy).